Rhoda was born in 1919, the daughter of Julius and Sarah Rosenzweig of the Bronx, NY. In her youth, she trained as a classical ballerina. The 1940 U.S. Census records her as single and 21, living in the Bronx with her widowed mother Sarah and her mother's younger sister, Lillian Unger. A year later, Rhoda met Robert Carter Stanley, Jr who was then serving in the National Guard Cavalry. They married in 1942 and had a daughter, Barbara, in 1944. Before the war, Robert had been working as a draftsman for an architect on Staten Island, but his dream was to become a freelance illustrator for pulp fiction digests and paperback books. That industry, he thought, was just the place for a young creative artist to make his living. After his discharge from military service, the couple moved to the Connecticut suburb town of Westport. 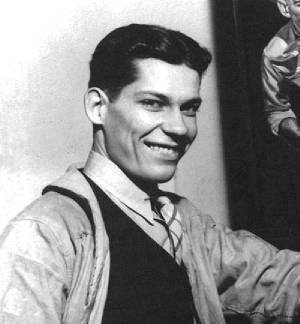 He received a few commissions from the pulp magazines of the era and his work drew attention from the major publishers of paperback novels. By the early 1950's, he was one of the most prolific cover artists for Dell. He also received commissions from such pulp novel publishers as Ace, Bantam, Beacon, Lancer, Lion, Monarch, Popular Library and Pyramid. His self-portrait was sometimes used as Dashiell Hammett's Sam Spade and became the most-used face for Brett Halliday's fictional detective, Michael Shayne. But he is better known for his "Good Girl Art", covers which portray beautiful ladies, often scantily clad, but not really smutty. And that brings us to our heroine, Rhoda Rosenzweig Stanley. She was the model for her husband's "GGA" covers. While the same artwork was sometimes used for two or more covers, her face or figure was the inspiration for over 200 different vintage paperback covers. The usual commission from a publisher told the artist generally what scene was required for their book cover, most often something based upon the novel itself. Rhoda Stanley would create the scene, using whatever props were appropriate, and place herself into that scene in the correct position and with the required facial expression. Robert would take photographs and paint from the photos. If a male was needed in the scene, he used himself as the model and they were photographed together using a time-delay shutter. Most of his finished paintings were on paper stock and roughly 8" x 11" in size. These original illustrations are now collector's art, many selling for over $1000 each. But fine examples of the vintage paperbacks which feature Robert Stanley cover art can be purchased for $10 to $20, although some bring $80 to $100 or more in pristine condition. Rhoda appears most often as a flaming redhead (her natural hair color), but Robert also drew her as a blonde or brunette where required to match the lady in the novel. One suspects that whenever the publisher did not specify hair color, they got the redhead version. The era of vintage paperbacks and pulp digests ended in the 1960's; Robert and Rhoda divorced in the 1970's. He remarried and moved to Florida, where he died on August 12, 1996 at age 78. We have been unable to learn anything further of Rhoda.